The French general elections for the Legislative were held on June 11 and 18 2017. The results provided by the French government are presented more accessible in wikipedia (a portal and no source), and have been used in this 2017-France-Lorenz-Gini excel sheet to determine the Lorenz curve and Gini coefficient. The earlier discussion on Lorenz curve and Gini was about the Dutch and UK general elections. Both UK and France have district representation (DR) with a First Past the Post rule. In the UK this causes strategic voting, in which a voter may not vote for the candidate of first choice, but tries to block a candidate who might win but would be worst. France has elections in two rounds so that there is less need for such a strategy. The second round is between the two top candidates in the district, and thus one might try to get at least one good candidate in that position. Proportional representation (PR) may allow a larger (but fairer) share of the seats for the more extreme parties, like the party of Geert Wilders in Holland, yet PR also allows more stability for the center. Thus PR tends to avoid the swings between extremes that might happen in systems of district representation (DR). The data of the first round provide the first preferences, and thus provide the votes. The data of both rounds provide the seats. This choice finds support in the data. The first round has a turnout of 48.7% and 0.5 million invalid or blank votes. In the second round, more people remain at home, with a turnout of 42.6%, while those who vote produce almost 2 million invalid or blank votes, who apparently disprove of the available candidates or the system itself. Thus the higher turnout and lower blanks in the first round suggest that these indeed present the first preferences (with some limited level of strategy). The Lorenz curve shows a rather surprising level of inequality, with a Gini of 41.6%. Compare the value of Holland with a Gini of 3.6%. If the blue line would cover the pink diagonal then there would be full proportionality. The following table gives the data on turnout for the first round. The votes for “Elected in the House” is for parties that eventually got elected in the Legislative. The votes for “Not in the House” is for a radical leftist party that got votes in the first round but got no seat in none of the rounds. The wasted vote consists of the invalid and blank votes and the latter “Not in the House”, to a total of almost 3%. A standard majority would be 289 seats of a House of 577 seats. If one would keep account of the wasted vote, then one might leave seats empty, or use a qualified majority of 298 seats, thus 9 more than usual. When we divide the electorate by the number of votes per seat, then the Legislative would require 1222 rather than 577 seats. A majority would require 611 seats, which is more than the actual number of seats used. If one would want to keep account of the voters who did not turn out, then 51.3% or 296 of the 577 seats would be empty, or one would use the 611 seats as a qualified majority. The new French President Emmanuel Macron had the highest score of 24% of the vote in the first round of the Presidential elections of 2017, with runner-up Marine Le Pen with 21.3%. Macron then won the second round with 66.1% (20.7 million) against Marine Le Pen with 33.9% (10.6 million) of the vote. For the Legislative, Macron’s party REM got 27.6% while the Front National (FN) got 12.9% in the first round. For the Legislative Le Pen managed to get only 3 million votes, compared to the potential of 10.6 million at the presidential elections. With both rounds REM got 308 seats and FN got 8 seats. These ratios would turn, if Le Pen would manage to motivate the voters of the presidential race to also support her for the Legislative. If the other parties would have a divided vote then Le Pen would benefit from First Past The Post. 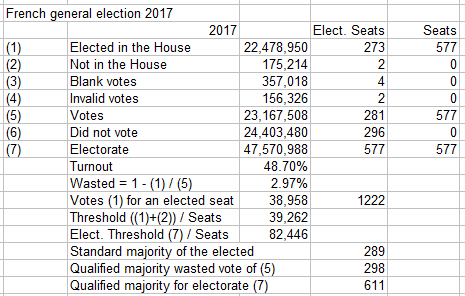 For the UK in 2017 we calculated a Gini of 15.6% but this was a very tentative number since we had no estimate about the amount of strategic voting involved. For France we have an indication of the first preferences, namely from the first round. 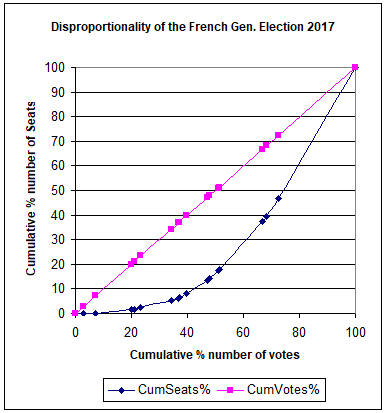 France appears to have a surprisingly high Gini of 41.6%, which can be compared to the system of proportional representation (PR) in Holland that generates 3.6%. This political inequality doesn’t bode well for the feelings amongst the French electorate about whether they are represented. The low turnout seems to reflect dissatisfaction rather than satisfaction. Such dissatisfaction might also translate into a protest vote over 4 years, especially when Macron doesn’t deliver. Many observers in Europe seem to be happy with the election of Macron and his party REM, but the outcome is quite disproportional. If this disproportionality can happen for one party then it might also happen for another party – that one doesn’t like as much.